We’ve all been there…frustratedly yelling REPRESENTATIVE into the phone while trying to navigate a phone tree most likely controlled by robots. If you ever do make it through roun ds of pressing 1 or # to a real person, the person on the other end of the line may have just answered a question about car parts when you really need help with your cable. Nine times out of ten (not sure if that’s an actual statistic, but it’s what it feels like) you hang up dissatisfied with your experience, wondering where you’ve gone wrong in life. We understand, and we can help. We call it the TA Way. 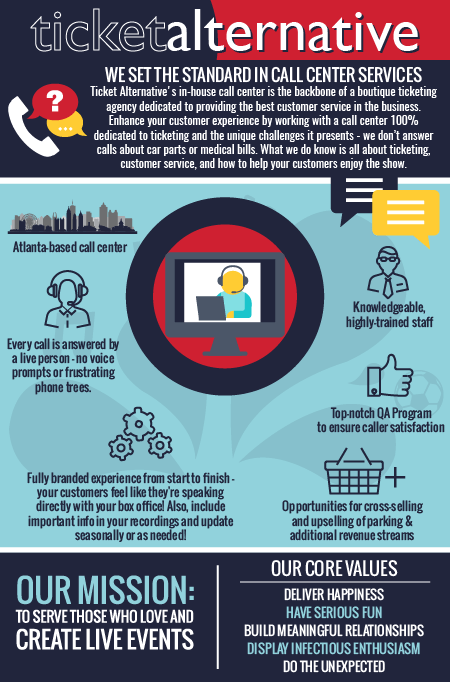 We are YOUR call center. Ticket Alternative is working daily to change the negative associations with call center customer service. In fact, we like to think we’re setting the bar in how it should all work. When patrons call us, they receive a fully branded experience, meaning if they’re calling to ask a question about The Fox Theater, our highly trained Customer Experience Representative answers the phone AS The Fox. The patron never knows they’re talking to Ticket Alternative’s call center. We’re 100% dedicated to ticketing. This means every person in our building knows the ins and outs of your venue and can answer unique questions about things like how far the overhang…well…hangs, as well as the best local restaurants, accommodations, and anything else that might be specific to ticketing your event. Our QA program is, how do you say, intense. Basically, we’re A+ students at TA. Our Customer Experience Representatives go through rigorous training and calls are monitored then scored using our stringent QA standards. (We have a whole white paper about them if you’re interested. Go here, scroll down, you’ll be prompted to download it.) Reps are incented based on their performance or given more training and coaching if opportunities are identified. We’re from Atlanta, so insert a Waffle House and/or Julio Jones joke here. But it’s really true. Seven days per week, 365 days per year, including weekends, holidays, birthdays, our favorite, National Puppy Day… you get our point. We can also work with you if you’re not in our time zone and can extend our hours as required to fit the needs of your venue! Ok, I don’t know if we’re ninjas, but the folks in our office do have a lot of cool side hustles, so it’s possible. We do love data and use it to help our clients plan everything from pre-sales to on-sales to staffing and more. We have tons of reports that we can customize and share with you to make sure you have up-to-date information about call volume, call times, sales, etc. Experiencing issues with your current call center, or just want to take your customer service to a whole new level? Let’s talk. We hear we’re good at it.